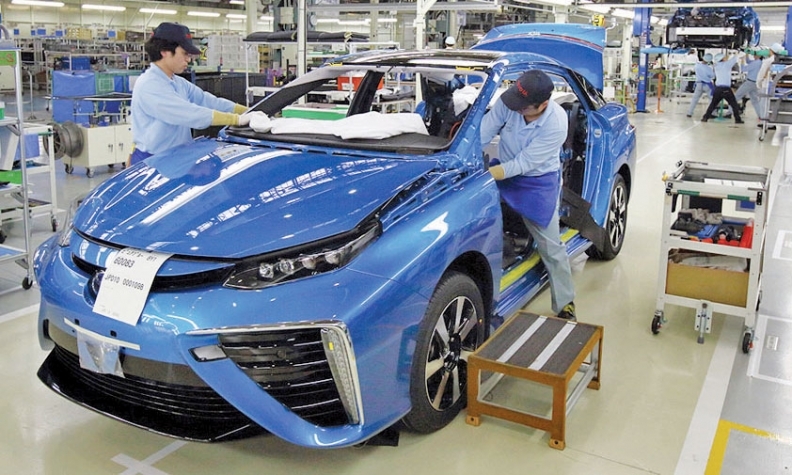 Could Toyota Mirai's hot demand and 2-year backlog undermine its success? Toyota is painstakingly building the Mirai fuel cell sedan. Thirteen workers churn out just three cars a day. TOKYO -- Would you buy a car if you had to wait two years for delivery? That’s what Toyota Motor Corp. is asking its customers to do with its Mirai hydrogen fuel cell vehicle. It appears the futuristic car is a victim of its own success. The car has been on sale in Japan only since Dec. 15. But orders are already pushing 2,000 units, an executive involved with the project said. That’s up from 1,500 in late January. The backlog means anyone ordering the car today will have to wait “two years or something,” the executive said. And the car still hasn’t gone on sale in the U.S. or Europe. It hits those markets later this year, with a U.S. debut this fall. That will only exacerbate the backorder dilemma. In response to greater-than-expected demand, Toyota said last month it will now make 2,000 units in 2016 and 3,000 in 2017. When Toyota unveiled the car, it said it would achieve cumulative sales of 3,000 by the end of 2017. This year, the company plans to build 700 Mirais, at a rate of just three a day. That will do little to alleviate the wait. Toyota says it wants to take it slow for several reasons. Engineers want a glitch-free rollout of what is a technically challenging car -- the three Mirias produced daily are handbuilt by 13 handpicked workers. And they also want to avoid overcommitting on volume for a product that has not yet been market-tested. But might a two-year wait discourage potential early adopters? Toyota and other manufacturers are already eyeing a next generation of fuel cell vehicles with a 2020 timeframe. Meanwhile, a new Toyota Prius hybrid, which promises a big jump in fuel economy, will be on sale. That car could make the Mirai look dated by the time its patient owners pick up their keys. And don’t underestimate the pure electric cars: In two years’ time, we may be seeing big improvements in the next-generation Nissan Leaf, the Chevrolet Bolt and who knows what from Tesla. Toyota must be mindful of alienating owners who finally get their Mirai in 2017, or later, knowing the technology is already 2 years old and that a new hydrogen car is around the corner. The last thing Toyota wants is an outbreak of buyer’s remorse over its so-called car of the future.